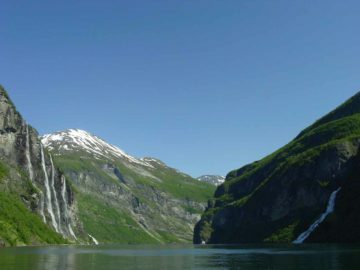 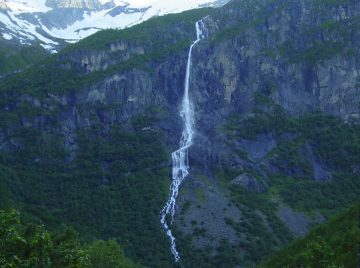 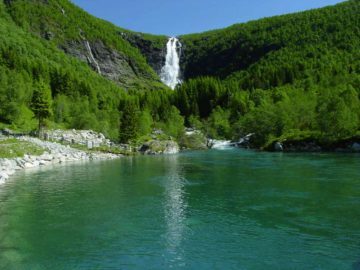 Sogn og Fjordane was a county that was rich in waterfalls, glaciers, and fjords. 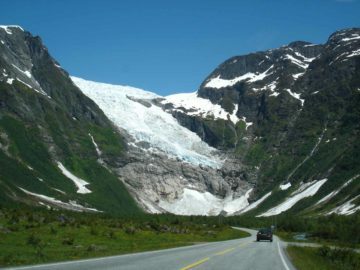 We not only visited at least three different arms of the vast Jostedalsbreen Glacier (Nigardsbreen, Bøyabreen, and Briksdalsbreen among others), but we also encountered numerous fjords including the world’s longest fjord in Sognefjorden from which many side fjords branched off of such as Lustrafjorden, Aurlandsfjorden, and more! 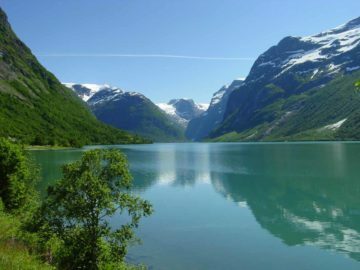 We were fortunate to have experienced much of this region in good weather so the bluish hues of the glaciers and the pastel blue-green colors of the lakes and fjords really stood out. 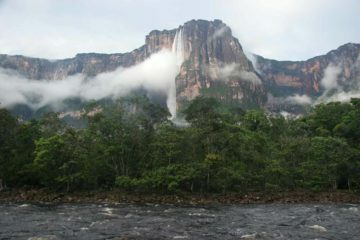 Indeed, Julie and I couldn’t have asked for a more varied waterfalling experience than what we were fortunate to see in the handful of days we spent here. 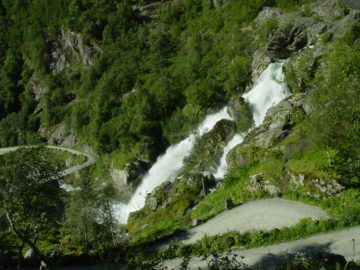 Speaking of waterfalls, our tour of this county started off with famous attractions such as Kjelfossen as well as Kjosfossen and the Flåm Railway, the unregulated waterfalls of Utladalen, including the highest single-drop waterfall left in Norway in Vettisfossen. 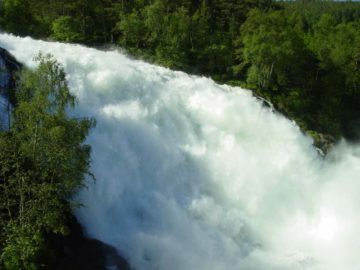 We also visited the second highest singular free-falling unregulated falls in Feigefossen as well as one of the most powerful waterfalls we had seen in the country in Eidsfossen. 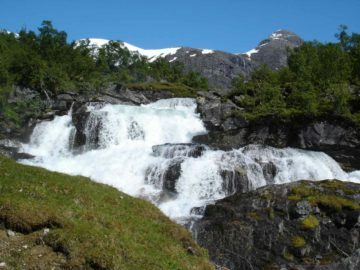 As if that weren’t enough, we then spent some time meandering through the Waterfall Country (Fossheimen) of the Sunnfjord region encompassing the municipalities of Førde and Gaular. 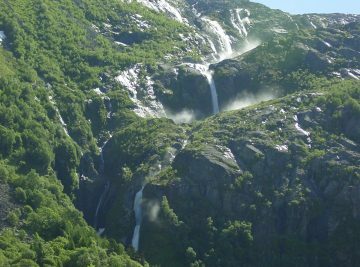 That was where we encountered the pretty Huldrefossen and Laukelandsfossen. 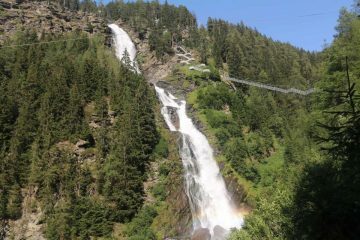 We even got a taste of the waterfall-rich Fossestein (Waterfall Path). 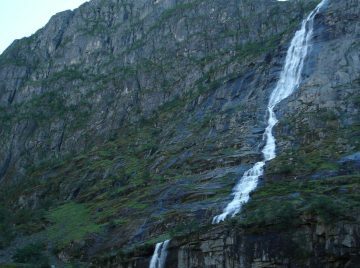 And then we saw waterfalls in hauntingly beautiful locations like Ramnefjellsfossen in Lodalen as well as Volefossen and Kleivafossen in Briksdalen. 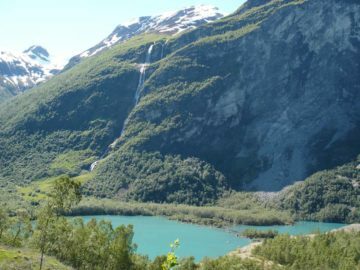 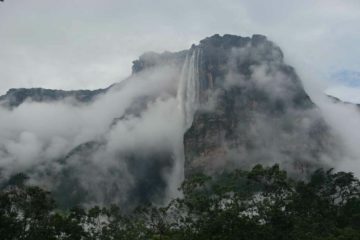 We definitely feel like we need to return to this part of the country, but even as I say this, have a look at the waterfalls we did manage to see so far. 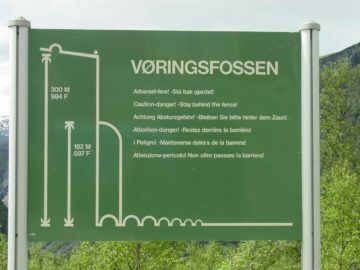 I’m willing to bet that it could induce waterfalling fatigue!